1. Receive text messages notifications: a.) You will need to define and 'verify your mobile number' in the 'Profile' screen. b.) This check box needs to be selected to receive text messages. 2. Receive push notifications: Install the ByteBloc mobile app and log into your account. 'Push notifications' for important events such as shift reminders are available for Android and iOS mobile devices. 3. Scheduled shift advance notice: Select a time or enter in minutes to receive a shift reminder alert. 4. Draft schedule published: Receive an alert when the draft schedule is released. 5. 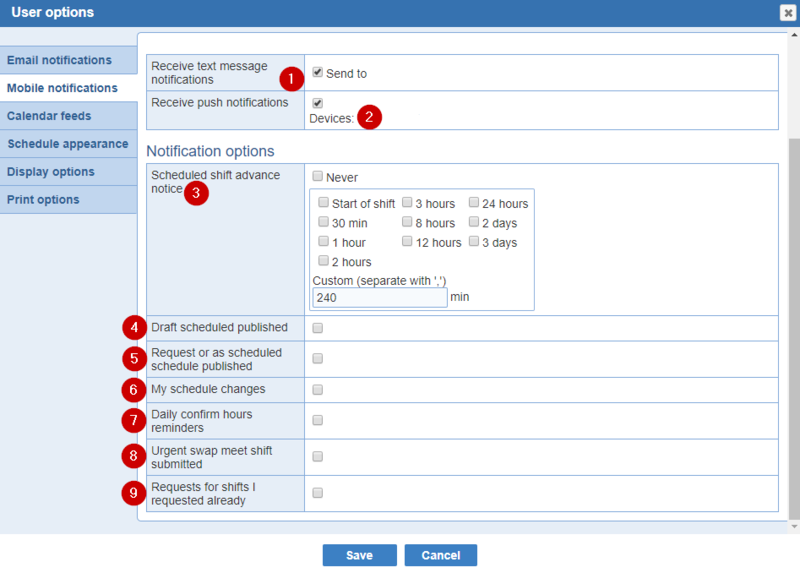 Request or as scheduled schedule published: Receive an alert when the 'Requests' and 'As-scheduled' schedule is released. 6. My schedules changes: Alert to be reminded of your schedule update to your shifts. 7. Daily confirm hours reminders: Receive a reminder to 'confirm' your shift hours. 8. Urgent swap meet shift submitted: Alert of an 'Urgent Swap Meet' shift that is available to take. 9. Requests for shifts I requested already: Notification of requested on shifts.